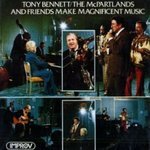 "Tony Bennett, the McPartlands and Friends Make Magnificent Music (viny" by Tony Bennett, Marian McPartland et al. Brian Torff is a contributing artist (bassist) on this LP. Watch What Happens -- Softly as in a Morning Sunrise -- Stompin' at the Savoy -- Lonely Avenue -- While We're Young -- In a Mellow Tone -- It Don't Mean a Thing -- Let's Do It -- Medley (S'wonderful / I Left My Heart in San Francisco). Bennett, Tony; McPartland, Marian; McPartland, Jimmy; Byrd, Charlie; Tate, Buddy; Dickerson, Vic; Reed, George; Torff, Brian Q.; Hall, Herb; and Martin, Spider, "Tony Bennett, the McPartlands and Friends Make Magnificent Music (vinyl LP)" (1977). Visual & Performing Arts Faculty Music Gallery. 34.